It's 2,000 miles from Chimacum to New York City, and just as far to return, but all together, it's a journey that might lead you back to yourself. On July 11, Chimacum reconvened to celebrate itself, and for at least one peninsula personality, it was a homecoming weekend. The fifth year of the Inter-Dependence Day Picnic & Talent Show, sponsored by the Chimacum Farmstand, was obscured by scud. (The inaugural event had "opened in a blizzard," noted Rob Story, general manager.) There was a sprinkle, but real rain would not have been unwelcome: We were experiencing a desperate midsummer drought that had despoiled the usually fertile soils of the Beaver Valley's renowned organic farming community. I had come the preceding summer and found it to be a singular event. This year there was a bluegrass band and free ice cream, and families - descendants of pioneers and new folks from back East - from all over, with clutches of small children frolicking on the grass like spring lambs, evidence of a fruitful year. The event was staged as a salute to tradition, but I sensed there was more to it. The host was a 30-something singer from New York City named Aba Kiser, who was back again this year. "This is where I always come to regroup and feel good about myself," she said. 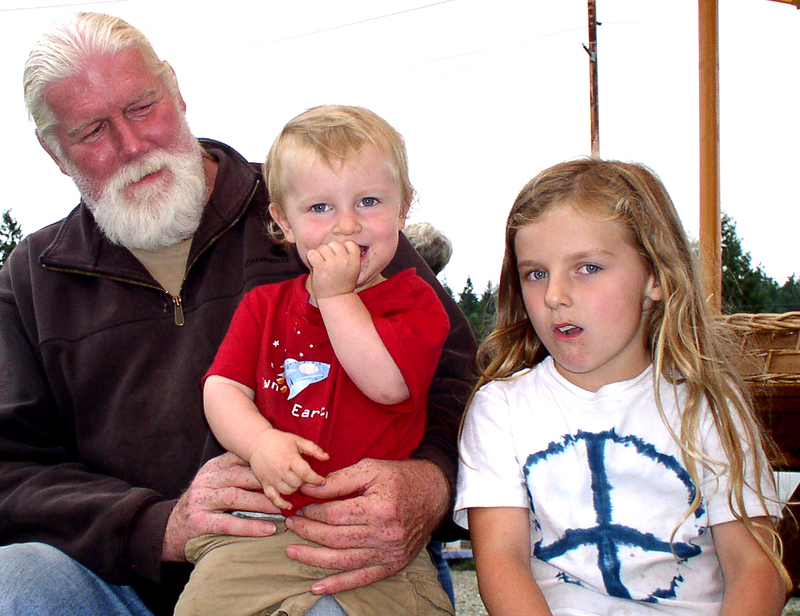 A Virginia native, Aba first visited the Pacific Northwest in 2006. In Seattle, she found work as a backup singer and toured the country, returning each year to study at Voice Works, the annual singing workshop by Centrum at Fort Worden in Port Townsend. I had begun my writing career in Chicago when I was about her age - a seminal event for someone born in Oklahoma - and so was interested in how the transition from rustic to urban life had changed her. "It's hard to live there," she said about New York. "It knocks you down. But it gives you inner strength." I thought she looked more mature and was better poised, but maybe that was because she was "in love" - she pronounced the word with all the poignancy it deserves, sotto voce, which is what you might expect from someone whose life is song. She settled in Brooklyn and got some theater work. 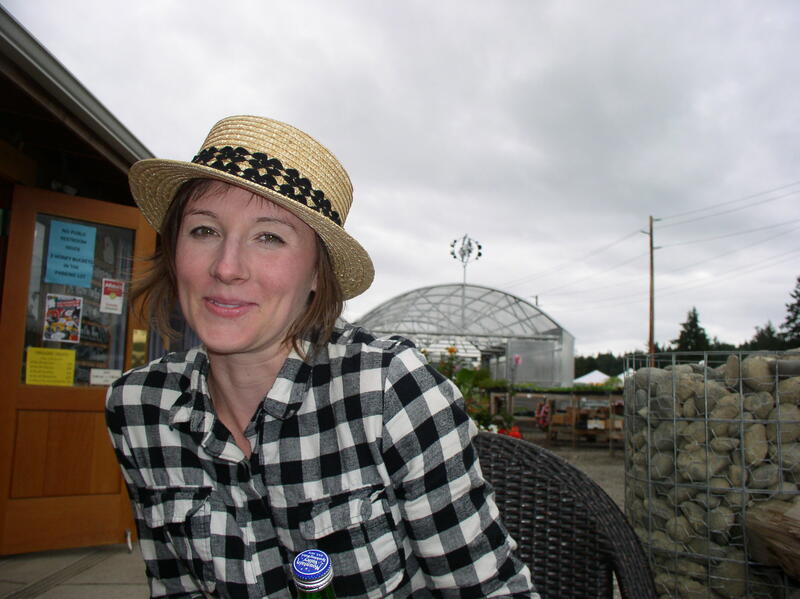 She played guitar, sang with a swing band and, with the help of Kate Copeland, a Port Townsend arranger of some repute who also lives in New York, cut a CD under the sobriquet "Abakis." We talked a little about the evolution of folk song. I admitted there was a lot about contemporary popular music that I understood not at all. She insisted she wasn't seeking to make a statement. "I'm looking for clarity, not confusion," she told me. "And I'm here to stay." 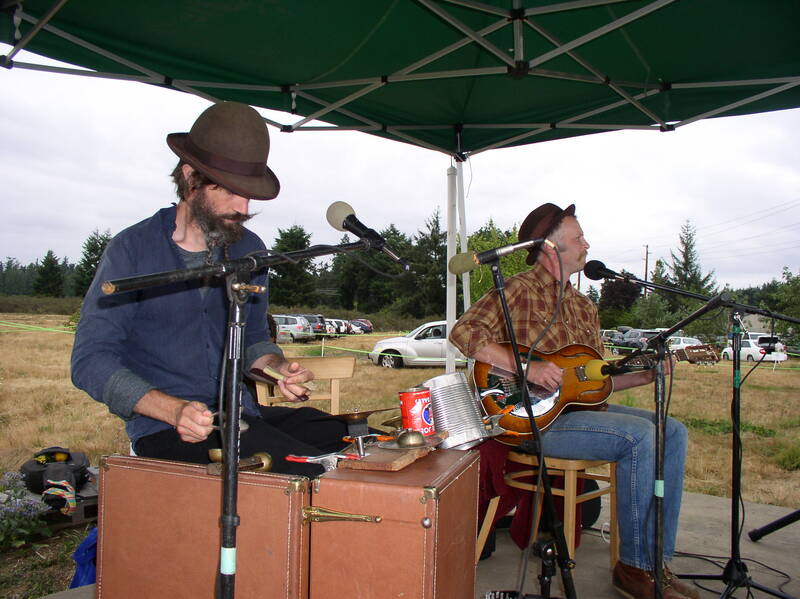 This year's headliners were the Gallus Brothers, a duo that Aba knew in Bellingham. The billing described them as playing "roots Americana." Well, they were eclectic, that's for sure. One moment they were picking bluegrass and the next it was like something out of "Zorba the Greek." Devin Champlin worked guitar and fiddle, while Lucas Hicks plucked banjo and clicked and clattered on wash tub, spoons, blocks, finger cymbals and a clamor of household utensils I couldn't immediately identify. I had the feeling he had emptied one of those all-purpose drawers that everyone has in their kitchen. For a reprise, they juggled a few balls, then packed up the kitchen sink and went home, whereupon a succession of locals mounted the stage for the talent show: "Eighteen five-minute acts of sheer bravery," is how Aba described it. A small boy spun a hula-hoop; a man and girl fiddled; someone soliloquized from "A Midsummer's Night Dream"; a file of kids told jokes to a laughing, clapping crowd - undersize Henny Youngmans with one-line gags, some of which I didn't get (whether it was them or me, I'm not sure) - but Aba was constrained to remark that "we have some real existential humor today." A pretty girl sang a pretty song she had written about rain: "trees are swinging like they want to sway with life � "; a girl named Hannah Poirier, in plaid shirt and patched Levis, recited an original poem that bore the gracious line "All stories bear the truth of life." As she exited the stage, she whispered to me, "I love to write poetry." It was all unpretentious and unspoiled and ludicrous and it seemed to me the most delightful day I had ever known. Not a single adolescent was to be seen stabbing a cell phone with his finger. I was squatting on a log by the stage when it came to me that this was not about tradition, not really. We were not rehearsing the past, no, we were rediscovering what we once hoped we might become. Now we danced, but not to an antique drum - we were in the now that is forever new, lived in values that are immutable. If we cannot change the world, let us at least keep the world from changing us. This was not revival. It was renaissance. The talent show concluded with a Yaqui Apache woman named Denise Miller, who chanted a sonorous Native American hymn. Her song brought me home for a moment: back to Cimarron and the Outchita Hills and my own boyhood on the edge of the Cherokee Indian Reservation, where sometimes my father and I would dance around an ancient, forlorn fire. As she finished, a formation of geese suddenly swept across the sky. "That sight," Aba said, looking up, "is in my brain forever." They seemed to be heading forever west.